A traditional home with interior wood framing is referred to as "stick-built" since so much of the lumber used is long, relatively narrow dimensional lumber, such as 2-by-4s. If you're trying to determine how much lumber you'll need to build an average-size home, say, one of 1,200 square feet, you'll have to consider the style of home you're building: Homes come in different styles, such as ranch, two-story and bi-level or tri-level. The style affects the amount of lumber that will be required. On-site stick-built homes are regulated by local building codes. 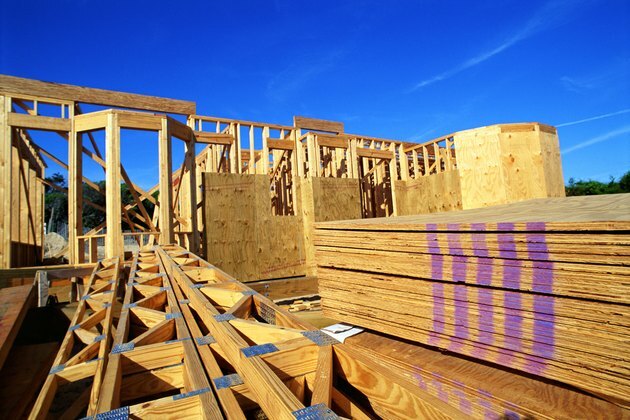 Home-building wood comes in four basic types -- framing studs, sheathing, plates and headers. The number of windows, doors and interior walls, the style of roof and the existence of a basement and garage determine the specs for the amount of wood a home needs. For example, a home with two large bedrooms will use fewer 2-by-4 wall studs and plywood sheets than one with three small bedrooms in the same space. Adding a second window to a room increases the amount of header wood required. A shopping list for a typical 1,200-square-foot ranch home provided by Tim Dooley of Mead Lumber in Vermillion, South Dakota, included 200 to 250 2-by-6-inch 8-foot-long exterior wall studs, 150 to 200 2-by-4 8-foot-long interior wall studs, 70 sheets of 4-by-8 foot 1/2-inch plywood for the interior wall sheathing, and 75-80 sheets of 4-by-8 foot 1/2-inch oriented-strand board for exterior and roof sheathing. Using drywall for interior wall sheathing might mitigate the need for most of your plywood sheating. Also included in Dooley's list are 13 8-foot-long 2-by-12 headers for creating door and window spaces, 40 16-foot-long 2-by-4 top and bottom wall plates and five 11-1/8-inch LVL beams for the garage headers. All the lumber is standard, carried at any full-service lumber yard. Many yards have computer programs that allow you to create a list of the lumber you need and tally the cost. Home plans are available from contractors, through magazines and books, and over the Internet. Plans give you complete blueprints along with a thorough materials list. Some people save a considerable amount of money on a new home by putting "sweat equity" into it by doing as much work as they can on their own. 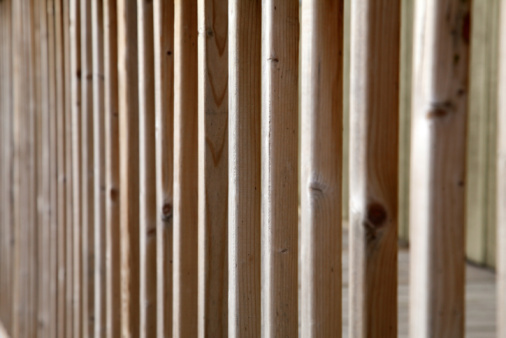 Framing, or actually putting the sticks and boards together, may look easy, but if it is done incorrectly it can cause the home to fall down when under stress such as from a hard wind or a heavy snowfall.